Although it's been out for just a month, Pokemon Go is already bleeding users. A new SurveyMonkey Intelligence report indicates that the game's user base has dropped by over 20% since its peak usage last month. The analytics company estimates that the game peaked at just under 40 million weekly average users (players who played the game at least once a week) in the United States in July. Since then, Pokemon Go's user base has dropped to just over 30 million, for a 22.7% drop. Critics of Pokemon Go might point to that twenty percent drop as a sign that the game is just a fading fad, but retention rates for mobile games are usually pretty low. According to Verto Analytics, even the most popular mobile games only retain about 30% of players a week after they first download the game. Typically, mobile games only retain about 15% a month after installation. For comparison's sake, Pokemon Go's retention rate was at nearly 60% during the game's peak in mid July. Since Pokemon Go is still averaging about 400,000 downloads a day, it's all but certain that Pokemon Go's retention rate has dropped even further from last month's high. 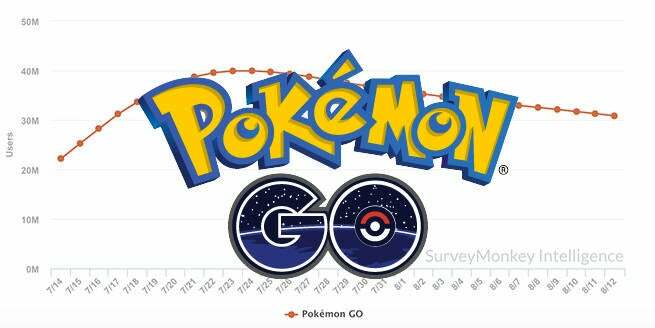 However, according to SurveyMonkey, Pokemon Go is still bringing in over $2 million per day in revenue in the US alone, so it's likely Niantic and Nintendo are still pleased with the game. Of course, that's not to say that everything is rosy with Pokemon Go. The game's online community nearly revolted two weeks ago after Niantic removed Pokemon Go's flawed tracker and forced many third party apps to shut down. Although Niantic seemingly opened up lines of communication and began testing a new beta system last week, the game developer has once again gone silent after beginning a ban campaign against alleged cheaters and GPS spoofers. If Niantic wants to keep Pokemon Go's user base from dipping more, it needs to continue to find ways to keep players engaged as they fill up their Pokedex and run out of places to explore in their community. A new update is expected sometime next week, so hopefully we'll see some new features then.